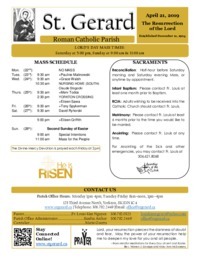 Welcome To The St. Gerard Roman Catholic Parish Website! Our Mass Schedule for the upcoming 7 days is available on every page of our website, and is updated continuously. When you select "All Services" at the bottom of the Mass Schedule, you will find a list for the next 7 days which includes times for Devotions, Prayer Vigils, and Reconciliation. Parish events have been organized into our Events Calendar. You will also find information about our Faith in our Ministries, Education, and Sacraments sections. Located in Yorkton, Saskatchewan, we seek to celebrate the glory of God the Father, and to promote the mission of our Lord Jesus Christ according to the precepts of the Church – building the Body of Christ and reaching out in love of the Holy Spirit. St. Gerard Parish is the first in the world to be named after St. Gerard Majella, as our parish was established the day of St. Gerard’s canonization (December 11, 1904).